I saw a chart on Bloomberg which rather amused me - so I have recreated it for you in this article. 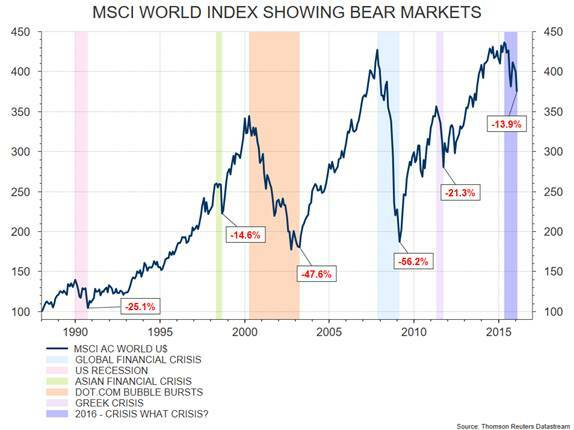 It is a chart that shows the bear markets in the MSCI world index since 1990. Interestingly we can name them all (see legend on chart) and the reasons they happened including; US recession, Asian financial crisis, the tech wreck, the global financial crisis, the Greek crisis. Then there is 2016, our market is down 21% and the MSCI world index is down 13.9% but no one has a name for it, or an excuse really. What are we going to call this bear market? The commodities rout maybe. Or the Chinese growth crisis. The quantitative easing headache we had to have. Or, as Supertramp fans might call it, the “Crisis what Crisis” bear market. It’s just begging the question, is there really a crisis?